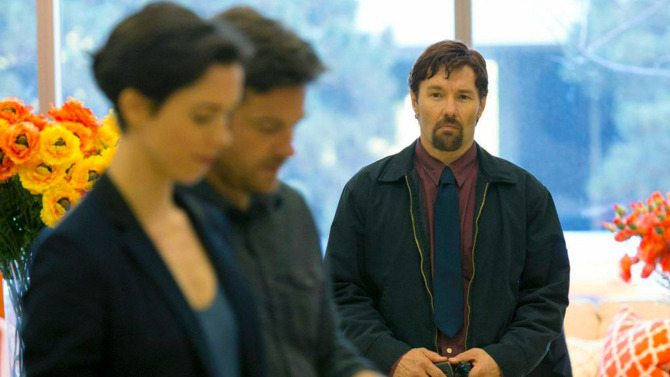 A chance encounter with ‘Gordo’ (Joel Edgerton) whilst shopping turns the lives of married couple, ‘Simon’ (Jason Bateman) and ‘Robyn’ (Rebecca Hall) into an almighty mess. Gordo is strange; there is no denying that, awkwardly stumbling through conversations and crossing social boundaries, Simon laughs about it with their dinner guests, mocking Gordo who he knew in high school, he calls him ‘Gordo the weirdo’. Robyn has sympathy though, dealing with her own issues, a new life in a new city, she cuts their new ‘friend’ some slack, cautiously engaging with him. A gift is left at her front door, then another. Is he a harmless unwanted distraction or is something more sinister lurking? Simon is career driven, an egomaniac that gets what he wants at any cost, he hides a past that begins to unravel, in part due to Robyn’s curiosity. Nothing in The Gift is, as it seems. Deception and lies are rife, sometimes from characters you least expect. Joel Edgerton plays the role of Gordo wonderfully, he stumbles through running a trivia night, he has a military background half-explained; he is a frumpy man of unfulfilled promise, with a monotone voice and dead eyes. He could be the guy at your work most likely to blow up your car because you parked in his spot. This is the brilliance of Edgerton, not only does he give Gordo many layers, he wrote this movie and directed it. Alfred Hitchcock would be proud; it’s a great thriller with twists that leave you gasping. Camera shots linger and previous scenes reveal themselves. There are no cheap thrills. Set in the hills of Los Angeles, amongst Mercedes Benz’s, big windowed houses and wine-filled dinner parties this is a movie with a constant uneasiness. A sense of dread that is never too far away, a high-income suburban life with a bright future at breaking point. At times its hard to watch, that’s what I loved about it, it will stay with you for days, lingering and lurking, just like Gordo. Thanks Swarmi . I’ll continue to workshop the floral style with a touch of whimsy. More economical words on the way, stay tuned. Loved this review, David. 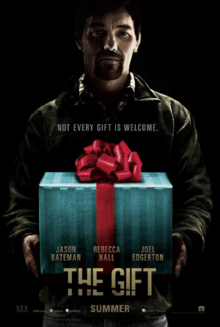 Will be watching The Gift ASAP! Thanks Libby, yes its a good one, you’ll be talking about Gordo for days !